Vinyls background image from Shutterstock.com. This insightful and entertaining look at the history of music piracy offers invaluable background to the hot-button issue of creativity and the law. Reprinted from Democracy of Sound: Music Piracy and the Remaking of American Copyright in the Twentieth Century (footnotes omitted) by Alex Sayf Cummings with permission from Oxford University Press USA. © 2013 Oxford University Press. No part of this excerpt may be reproduced or printed without permission in writing from the publisher. At each step, a new and different version of the original music is created, whether a performer’s recording of a composition, a cover artist’s reinterpretation of another recording, or the digital file extracted from a compact disc. The fact that one piece of music can be split into written symbols, mechanical sounds, and multiple interpretations has caused many headaches for those who have tried to figure out who owns the scripts and vibrations. Consumers, entrepreneurs, lawmakers, and musicians grappled with this conundrum, as the technological means of reproducing music grew increasingly numerous and complex over the course of the twentieth century. From the first mechanical reproductions of music in the 1870s to media as different as magnetic tape and the Internet, locating the author of a musical creation—or the owner of a musical commodity—has proven difficult. What counts as music, and who should be able to control it? Is it the idea of a melody, the written composition, the live performance, or the inscription of a performance on vinyl, tape, or disc? Should the songwriter, performer, or record company have the exclusive right to control the production of a sound recording and benefit from selling copies of it? For much of the twentieth century, legal authorities could not answer these questions, and federal copyright law actually held that no one owned the recording itself once it was published. Under a system established by Congress in 1909, the songwriter (or the publisher who held the rights to a song) could choose to license the first mechanical use of a composition, but any subsequent renditions were beyond the copyright holder’s control. The composer would receive a flat royalty for each copy made of a recording of the song, but that was all. And, until 1972, the producers of mechanical copies of music, such as long-playing (LP) vinyl records, piano rolls, or wax cylinders, could not copyright their products. Throughout this period, Americans weighed musicians’ and companies’ interest in controlling the products they created against the public’s interest in having uninhibited access to music. During the Progressive Era, Congress feared that the recording industry would be consumed by monopoly and favored protecting the public domain over strengthening property rights. Courts subsequently wrestled with the dilemma of how to respect the value that artists and entrepreneurs had invested in recordings, even though lawmakers had explicitly excluded any such consideration. As usual, attention to copyright surged upon the introduction of popular new forms of communication. As media such as the phonograph and radio became familiar to American society in the early twentieth century, judges and legislators had to grapple with the ways various technologies affected the rights of copyright owners. Many of the new gadgets, whether a paper piano roll or a shellac disc, involved the reproduction of sound, and mechanical reproductions provoked some of the most heated debates about the proper assignment of rights. The earliest cases sought to mark the line between the copyrightable music and the machine that conveyed it; once the Copyright Act of 1909 provided an ingenious way of drawing that line, courts faced new questions about whether or not record companies (and, in a related case, a news agency) had any right to prevent others from copying or otherwise exploiting their works. For Griffin Hall, a talking machine would be a machine that mimicked a human being, but the boy in his play merely imitated such a machine. The professor assumed that a machine that could reproduce the sound of human communication, and even interact intelligently with humans, would evoke wonder and fear in others. His talking machine was an agent of deception, a recurrent theme throughout discussions of sound reproduction. In fact, the early history of the talking machine was full of imitators, copycats, and frauds who reproduced the recordings of others for sale on the disorderly market of the late nineteenth century. The disarray in the industry resulted in part from uncertainty about which recording format would prevail and what uses would be made of multiple new technologies. Would consumers buy a wax cylinder machine to make recordings in their homes and offices, as Thomas Edison predicted? Would they purchase records to listen to stories or music? Like the boy in the box, the sounds inscribed on early phonographs simply provided the aural content for a physical object, engraved on the surface of a wax cylinder only to be wiped away and replaced by the traces of other sounds. What the talking machine said mattered less than that it spoke and, perhaps, how well it spoke. Record manufacturers tended to emphasize the technical quality of their mechanical reproductions rather than the musical or literary performances contained in them. The bawdy stories, tinny songs, speeches, and jokes were often brazenly appropriated by competitors as the market for recorded music gradually took shape, and phonograph companies—largely consumed by patent battles involving the technology of recording itself—devoted little attention to asserting rights to the performances contained on their products. A few firms did move to protect the value of the performances they recorded and sold in the first decade of the twentieth century; Emile Berliner, for instance, sued New York’s Standard Talking Machine Company for violating his patents in 1898 and subsequently sought an injunction when several of the company’s leaders went on to copy Victor recordings through the American Talking Machine Company in 1904. The Bogus Talking Machine is also a reminder that, in the earliest days of recording, the “talking machine” was just that—a vehicle for human speech. Edison initially conceived of his invention as a tool for capturing ordinary voices as much as singers or musicians; the original impetus for the phonograph had been his desire to record messages sent over the telephone. The early avatars for sound recording were characters associated with speech. The most iconic, the little white dog named Nipper, has defined the Victor image up to the present day. Nipper also bequeathed to the world “His Master’s Voice,” a slogan that became synonymous with Victor—even though the phrase has been completely severed from its original context. The image was based on a painting by the brother of Victor pioneer Eldridge Johnson, in which Nipper listens to a wax cylinder recording of his owner’s voice. The dog looks rapt and attentive, as if his master were standing right there. The cylinder, of course, could be recorded on and could indeed have contained a reminder made by the pet’s owner. When Victor adopted the image of the dog, the cylinder was replaced with a disc phonograph, a medium that did not allow consumers to make their own recordings. Unless the dog belonged to a recording artist like Enrico Caruso, it was unlikely to feature the actual voice of his master. Soon after, the Ohio Talking Machine Company not only copied Victor’s phonograph patents but also used a wry variation on the company’s trademark image. The outfit at first placed a shaggy dog next to its phonograph, above the slogan “Familiar Voices.” In 1904 the company’s Talk-O-Phone brand swapped the dog for a parrot, an animal better known for talking than singing, and Ohio soon dropped the “Familiar Voices” slogan in favor of “Learning a Few New Ones.” Another pirate, Zon-O-Phone, used the slogan “On Speaking Terms,” and pictured a child leaning into a phonograph much like the attentive Nipper. Like “His Master’s Voice,” the slogan implied an interpersonal relationship with a machine that did what no other could—talk. Source: Phonoscope 1, no. 10 (August–September 1897): 3. Americans of the turn of the century broadly associated sound recording with communication, rather than with music or entertainment alone. Promoters of cylinders and discs emphasized the accuracy of their devices in replicating human expression, and they pointed to the “original” quality of a recording as proof of its precision and truthfulness. Like the Victor player, the machines would capture the essence of a person; after all, the recording had to be excellent for Nipper to mistake it for his master. The Norcross Phonograph Company of New York did not trumpet the aesthetic quality of the performances on its recordings, but rather blared “GREAT VOLUME, PERFECT REPRODUCTION, AND FINE QUALITY OF TONE” across the top of its ads in 1897. 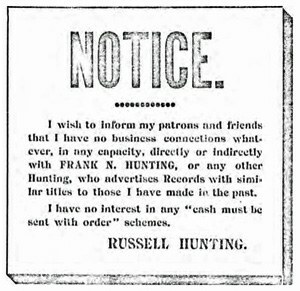 The comedian Russell Hunting also advertised his records as “loud, clear and distinct” the year before. 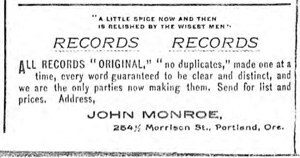 The ad pointed out that the “Standard Humorous Talking Records” were distributed to “all parts of the English speaking world”—a crucial fact, since many of the recordings consisted of stories about the antics of two greenhorns, Hiram and Casey. (In one episode, Casey tries to auction “a pug dog, a pair of gentleman’s pants and photograph picture of Napoleon Boneypart.”) A spoken story is much less likely than music to be appreciated among people of different tongues around the world. 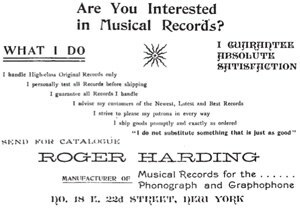 In the hurly burly of the early record industry, virtually nothing was sacred. Copyright laws did not address how the music on cylinders and discs ought to be regulated. Congress did pass a bill in 1897 to give composers the right to control performances of their work, so that music venues, for instance, had to remunerate songwriters. The new law, though, proved difficult to enforce and only applied to live human performances—the scratchy sounds that issued from wax cylinders in homes and public phonograph parlors did not count as public performances. Thus, early entrepreneurs in sound recording were free to run riot with other people’s work, recording performances of songs without paying composers, copying recordings by other companies and artists, and even sticking the names of well-known artists on recordings by unknowns. into buying recordings not actually made by Hunting. Holding was not the only artist decrying the unauthorized use of his identity. Hunting also highlighted the veracity of his records because “certain unprincipled individuals and corporations are duplicating my work, thereby deceiving the public by furnishing a record about one-third as loud as the original.” Hunting’s emphasis on volume strikes the contemporary reader as odd. He complained that piracy was bad, not because his competitors took advantage of the imaginative element of his story or the skill that went into performing and recording it, but because the unauthorized copy failed to be as loud as the original, damaging the reputation of the Casey records and defrauding the consumer. For Hunting, the technical quality of the device mattered more than its creative content.